There seems to be general agreement that 2016 was a rough year. Yes, there were blessings and accomplishments and laughter, too. But a rough year. What was so heartening for me was how my clients and friends seemed mobilized by the tough experiences – each ready to make a difference in their own way. What’s the difference you are uniquely designed to make? What’s the thing that lights you up and allows you to shine your light on others? 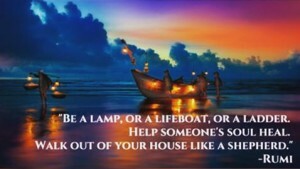 This Rumi quote is one of my favorites: “Be a lamp or a lifeboat or a ladder. Help someone’s soul heal. 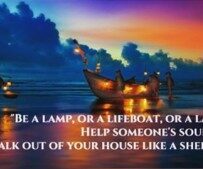 Walk out of your house like a shepherd.” What’s the thing you naturally do that is a light in other people’s lives? We often devalue our gifts and strengths, thinking that if it comes easy to us, it must be easy for everyone else. Not so! There is something that only you can contribute to the world – it may or may not be vocational, and it may or may not be what you think! I’m privileged to work with incredible clients every day so that they can understand themselves and others better – and so they can use their gifts to be a lamp, a lifeboat, or a ladder. Creating understanding and acceptance is, I hope, the way in which I bring my light to the world. What’s yours? If you don’t know, that’s ok – and not unusual. But please create some space for the question in 2017, because the world needs your light!